o Press the brake pedal. o Press the clutch pedal with a manual transaxle. o Shift into N (Neutral) with an automatic transaxle. o Press the CANCEL switch located on the steering wheel. o Decrease the vehicle speed lower than the memory speed by 9 mph (15 km/h). o Decrease the vehicle speed to less than approximately 25 mph (40 km/h). Each of these actions will cancel cruise control operation (the SET indicator light in the instrument cluster will go off), but it will not turn the system off. 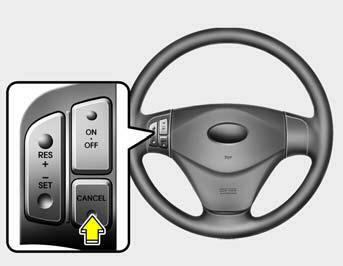 If you wish to resume cruise control operation, push the RES/+ switch located on your steering wheel. You will return to your previously preset speed.